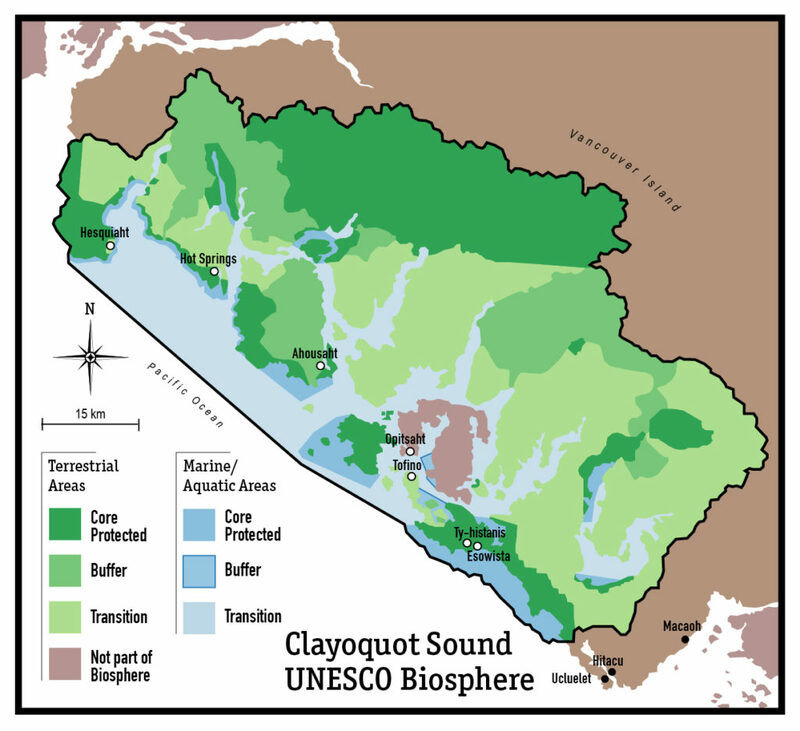 The Clayoquot Sound Biosphere Reserve is situated in Vancouver Island on the west coast of British Columbia, within the Pacific Northwest Coast ecoregion. It is ecologically defined by coastal mountains, temperate rainforests, networks of riparian areas and wetlands, a rugged coastline, coastal sand ecosystems, estuaries, a thriving marine environment and healthy human communities. The coastal landscape’s fjords, sounds, headlands and sand ecosystems have been shaped by the advance and retreat of glacial sheets as recently at 15,000 years ago. The mild climate in the BR is moderated by the Pacific Ocean. The landscape receives heavy rainfall which supports the growth of dense coniferous temperate rainforests and delivers freshwater down mountains and through riparian forests, lakes and wetlands to empty into the Pacific Ocean mixing with the saltwater forming productive estuarine complexes.